Are you at a loss of what the menu should be for your next dinner? Or are you planning to lose those extra pounds and eat healthy this summer? Most people love to have salads in their meals either as starters, full meals or as side dishes. Also salads are greatly loved by vegetarians as they are full of various fruits and vegetables. These sorts of foods not only enable your stomach to get filled up instantly but also help in getting rid of extra fat on your body. 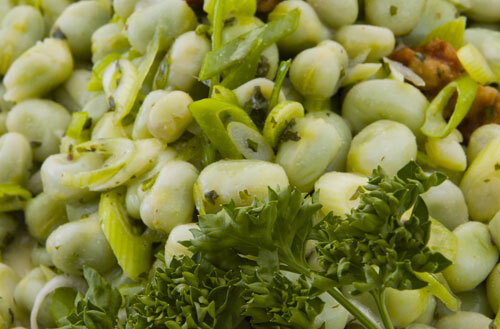 Broad bean salad is a flavorsome dish that is prepared in no time. You can give several variations to this recipe by adding different ingredients or can serve it as a chilled salad. You can also serve it at room temperature and can even add more spices in it depending upon your taste and requirement. Utensils: Salad Serving Bowl, Salad Serving Spoon, Standard Chopping Knife, Chopping Board. Before getting started, it is important to make sure that all the vegetables are fresh and are washed properly. Combine all the ingredients including broad beans, chopped tomatoes, onion rings, chopped cucumber and mashed garlic and add lime juice. Let all the ingredients marinate together and mix them well. Season it mint, parsley, salt and grounded black pepper. The salad is ready to be served. But before that, make sure you have put it in a nice, presentable bowl to complement the taste with its presentation.